Take a look at that dust! If you own a digital SLR and a couple of lenses, there will surely come a time when you look at a group of pictures on your monitor and see spots in the same place on every image. These are often the results of dust specks that have landed on your camera’s sensor, and they are a nuisance, but you can deal with them. Removing the dust digitally is fine for the occasional spot, but you really don’t want to leave dust on your camera’s sensor. Luckily, a broad range of sensor-cleaning tools have become available, and most modern D-SLRs have a method for letting you get access to the sensor to clean it. You do have to be careful; if you’re not, you can damage the sensor. That said, I have been cleaning my Canon D-SLRs for years without any trouble, and I don’t know of any serious photographer who doesn’t keep a cleaning kit or a blower brush on hand for those times when they need to clean the sensor. One of the problems with cleaning the sensor is that most times you don’t know where the dust is when you’re looking inside the camera. Also, you don’t know if you’ve been successful until after you’ve put your cleaning stuff away, remounted the lens, taken a picture or two, and looked at it on your Mac. If you still have some dust, you then need to go back to step one, a frustrating process, and one I’ve had to do far too many times. That’s why I’ve been waiting to see VisibleDust’s Sensor Loupe, an illuminated magnifier that sits on top of your camera’s lens opening, giving you a well-lit, perfect view of your sensor (and the tiny little dust particles that sit on it). Since getting the Sensor Loupe last week, I’ve used it effectively on four D-SLRs. I was able to clean the dust out of my Canon EOS 5D and Digital Rebel with different brushes and swabs. I also removed a pesky, elusive spot from my EOS 10D’s sensor that had been bugging me for some time. For $70, you get a solid tool that helps you keep a clean sensor. 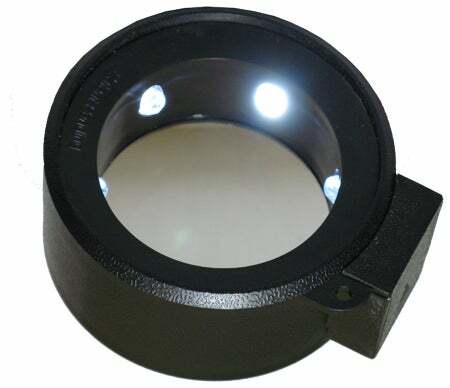 VisibleDust isn’t the only company offering a lighted loupe for viewing your sensor. My colleague Kelly Turner wrote about Delkin’s $90 SensorScope, which she saw at PMA in March. One clear difference between the Delkin and VisibleDust models is the switch: the SensorScope has a pressure-based switch, which means that you can’t easily hold it and use your other hand to clean the sensor at the same time. The Sensor Loupe has a full on-off switch, which means that you can turn it on and focus it on the sensor while you’re cleaning. The Sensor Loupe is also smaller, which means it’s a bit more portable, and comes with a nice case that helps keep it all together in your camera bag. There are a lot of cleaning tools out there. I can recommend VisibleDust’s Sensor Brush and a number of their wet cleaning kits, and folks like Rob Galbraith use them on a regular basis as well. I also use Copper Hill Images’ Sensor Sweep and their wet cleaning kit to good effect (photographer Dean Chriss also likes the Copper Hill products). When you’re looking for a wet-cleaning solution, most photographers I know much prefer using pre-built swabs when out in the field—there’s less chance of contamination, and it makes cleaning a much quicker process. Pre-built swabs are more expensive, however. Camera manufacturers are getting hip to the dust issue. Olympus was one of the first companies to offer a self-cleaning sensor. Canon followed with a dust-resistant sensor in the EOS Digital Rebel XTi ( ), which supposedly “shakes” the dust off with every power cycle, and Sony’s D-SLR-A1090K ( ) has similar circuitry. I haven’t had a chance to play with any long enough to determine how well they actually work, but, based on some of the reviews, it still seems more like a gimmick than a cure-all for dust problems. Another product that I saw at PMA, NRD’s FireFly, isn’t out yet, but it claims to offer a “no-touch” method for cleaning your sensor. The FireFly is a strange-looking contraption that marries a Giotto Rocket Air Blower with an NRD-made ionizer “to direct a burst of anti-static air onto the sensor. Once the non-fixed dirt and dust particles lose their electrostatic charge, they simply fall off the sensor.” It still isn’t shipping however, and the company was mum on pricing when I spoke with them (A Wired blog entry claimed that the FireFly would be approximately $200, which seems high to me). Do you have to have a magnified loupe and an expensive kit with brushes and swabs? Absolutely not, but they definitely are convenient, and for me, they’re worth it. If you’re a do-it-yourselfer, you can probably rig something up with a magnified light and art supply brushes, but make sure you know what you’re doing before you touch the sensor. You might want to read Petteri Sulonen’s How To Brush Your Sensor before you start, however. You can find also find video tutorials on YouTube that show the basics, if you want to see what you’re getting yourself into. If the idea of opening your camera and sticking a swab or brush inside it makes you nervous, you can bring your it to your local camera shop, and they should be able to do it—for a fee, of course. Some might not want to do it, though, and they’ll send it back to the manufacturer, which of course adds time and (more) cost to the proposition. In that case, “fixing it in post” (i.e. on your Mac) might be your best option.